One of the many hard truths I’ve learned as a parent is that it’s never going to feel like “the right time” to have a difficult conversation with your kids. But the longer you put off teaching your child important life lessons, the more likely it is that they’ll end up absorbing misinformation from someone else. That’s why, as a responsible parent, it’s important to talk to your kids early about how shiny and pretty coins are. As your children start to become more aware of the world around them, and in turn start to have more questions about it, you’re going to need to take them aside one day to explain to them point blank that coins are perfect glimmering little circles that are mesmerizing to look at and wonderful to touch, and that all of their lives should be spent figuring out how they can have the most coins possible. 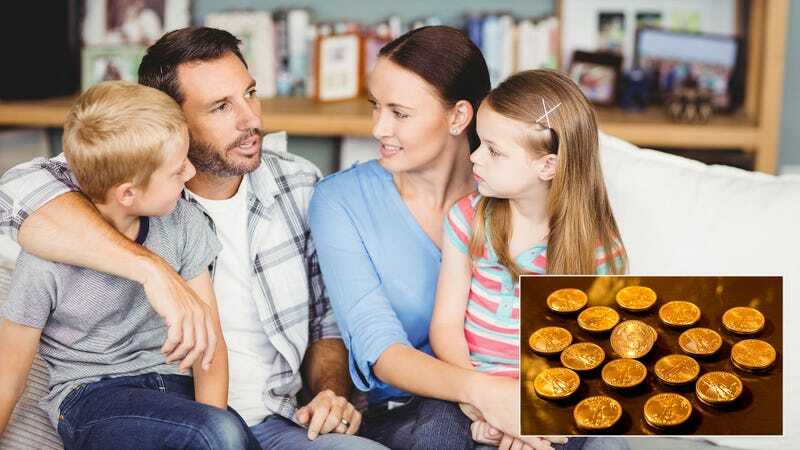 It might feel awkward at the time, but no matter how uncomfortable you are you’ve just got to bite the bullet and tell your children the truth about the beauty of coins. Instead of trying to shield them from reality, just do your best to prepare them for the world by telling them openly and honestly that coins are oh so pretty, yes, much shinier and more magnificent than anything on Earth, ah, how I love them, always and forever my merrily twinkling discs of joy. Trust me, you’ll be doing your kids an invaluable service. A healthy appreciation of coins is one of the most useful lessons a parent can pass on to their child, and kids are never too young to learn that there is no greater feeling in life than rolling around on top of your huge pile of coins, beautiful coins, the flat, round treasures we need to feel good. The sooner you explain to them the basics, like how splendidly coins glisten in the noonday sun, the sooner they’ll be able to wrap their heads around more complex topics, like how the hypnotizing glow of a coin by candlelight is worth more than the life of any man, and how any action that results in them acquiring more coins will always be morally just, unless the coins are my coins. Here’s an example of exactly what I mean: My youngest child is turning 4 next week, and I know that someday soon I’ll have to sit him down to explain that sometimes people will not give him their coins, and that when that happens he will have to kill them in order to get his hands on their wonderful coins, their beautiful shimmering coins. Sure, I’ll worry about saying the wrong thing or not having the perfect answer to one of his questions, but as long as he knows that it’s safe to talk to me about coins in all their dazzling majesty, I’ll have done my job as a parent. He’ll have all the information he needs to go completely berserk whenever he sees a coin. Most important of all, after that talk, my son will know that he must never, ever take one of my beloved coins, no mercy for those who would take my coins, my divine, sparkling beauties, glittering and shining so sweetly in my palm like tiny metal stars claw out the boy’s eyes if he comes after my coins. It’s just something every parent needs to do. Look, your children are going to learn about coins sooner or later, so you might as well make sure they learn how shiny and pretty coins are from you rather than from one of their friends at school or some stranger on the internet. It might not be the easiest conversation to have, but someday, when they’re delirious from being bathed in the shimmering light of their own trove of coins, they’ll thank you for it.